The new amphibious assault ship USS America is heading to San Diego after completing it’s “America Visits the Americas” goodwill tour. The 51,000-ton, “big deck” assault ship departed Callao, Peru, on Sept. 3. It was the final port visit on the ship’s maiden transit from Ingalls Shipbuilding in Pascagoula, MS, to its home port of San Diego. The crew visited Cartagena, Colombia; Guantanamo Bay, Cuba; Rio de Janeiro, Brazil; and Valparaiso, Chile before the stop in Peru. While in Peru, the ship hosted a reception in the ship’s hangar bay for more than 300 guests. The distinguished guests included Brian A. Nichols, U.S. Ambassador to Peru; Gen. John F. Kelly, commander, U.S. Southern Command; as well as senior Peruvian, U.S. government and military officials. While in port, 25 America Sailors participated in a community relations project with Peruvian Navy sailors at Immaculate Conception Municipal School. The volunteers teamed up with the Peruvian sailors to paint portions of the school and refurbish the lawn. America’s soccer team also played a friendly match against the local Peruvian Navy team. After the game, members from both teams exchanged mementos and enjoyed a barbecue prepared by the Peruvian Navy. In addition, members of the America crew participated in rugby and basketball games with Peruvian Navy sailors. America is the first ship of its class, replacing the Tarawa-class of amphibious assault ships. 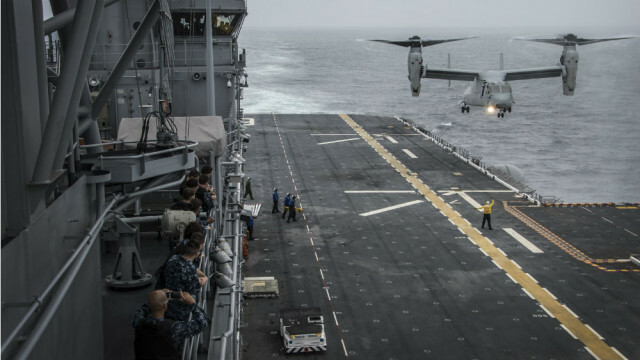 As the next generation “big-deck” amphibious assault ship, America is optimized for aviation, capable of supporting current and future aircraft such as the tilt-rotor MV-22 Osprey and F-35B Joint Strike Fighter. The ship is scheduled to be ceremoniously commissioned Oct. 11.